DID THE B&B DESTROY THE NATION'S LARGEST DOUGLAS FIR? During the weeks that the Booth Lake and Bear Butte Fires burned, and especially during the week when the two fires merged into one fire in the vicinity of these two ancient forest patriarchs, it seemed certain that their long lives had ended in fire. But Hurrah! The September 12th, 6:00 pm. official fire update had very good news, " The states largest and second largest Douglas Fir trees that were in the fire area have survived the fire. Both had also survived at least two previous fires. Many fire dependent species have thick bark that is fire resistant and protects the inner part of the tree from the fires heat." In fact, if you will look closely at the bark in my picture, you will begin to see blackish areas, which are ancient fire scars (I''ve enhanced the bark to better show its texture and the scars). And then the next day's fire update added further cheering details, "Two Record Book Douglas Fir Trees Survive Fire....Two of the nations largest Rocky Mountain Douglas fir trees have survived the fires of the B and B Complex. Rocky Mountain Douglas firs are the inland variety of the species that grows in drier forests and are generally smaller than the coastal variety. 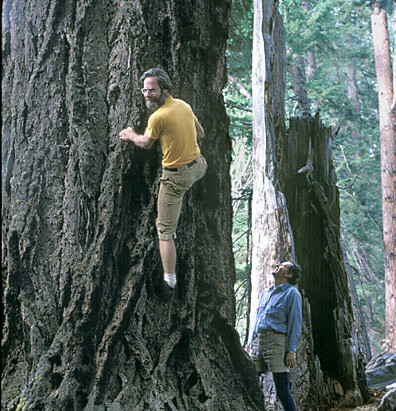 The National Tree Register tracks the largest trees of each species in each state and in the nation. The trees are the largest two Rocky Mountain Douglas-fir trees in the United States. Oregon Department of Forestry keeps records with in the state and nominates trees to the national register. The two record trees were seen during a helicopter reconnaissance flight and are alive and well. Many thousands of acres of trees were killed during the B and B Complex but survival of the two record trees gave a ray of hope to fire fighters and National Forest Personnel.".... Note: PICTURE BELOW, Late November, 2005: a reader has just sent me a new image of this tree, taken from the exact spot of my 1977 image. Take a look It's interesting to note what the passage of nearly 30 years has wrought-- see if you can see the changes (picture credit: Rodger Latham)! . .......Click this link to see the desolate condition of the main trail nearby in 2004 (one year after the Fire). Click this link to visit Oregon's largest Douglas Fir tree, which is located within Oregon Caves National Monument in Southwest Oregon. 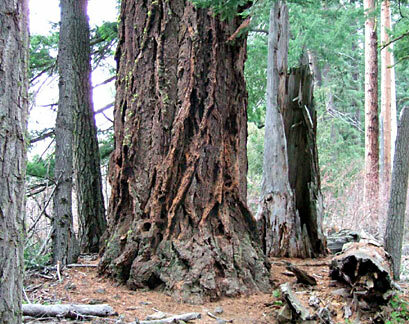 Click this link to find information about "Big Red," Oregon's largest Ponderosa Pine. DID THE B&B FIRE DESTROY THIS HISTORIC TRAIL JUNCTION AND ITS ANCIENT SIGNPOST TREE? IT HAS TAKEN EIGHT YEARS TO ANSWER THIS QUESTION! READ ON FOR THE STORY OF "THE TREE"; the re-finding of the historic Summit Trail in 2014; and a hike on the Brush Creek Trail. JUNCTION: THE SUMMIT TRAIL MEETS THE BRUSH CREEK TRAIL, elevation 6,119 feet. Picture taken by author, 1973. Long before the existence of the Pacific Crest Trail, the historic "Summit Trail" No. 65 was the key to the wonders of the entire alpine region between Santiam Pass and Mt. Jefferson. In fact, the 1921 map that officially announced the initiation of "The Oregon Skyline Trail" shows an original route passing through the immediate vicinity of this tree, but at the time there was no need for a trail junction sign because the Brush Creek Trail No. 69 had not yet been built (I will abbreivate as "BCT").... The BCT came into existence at some unknown time between 1936 and 1952, so there is no record of exactly when the huge Mountain Hemlock above became the signpost for the trail junction. It may have been as long ago as the 1930s. The trail signs are roughly 18-20 inches long. And in October 2012, my correspondent Thomas J. measured the circumference of THE TREE at the requisite five-foot level and obtained a reading of 15 feet. This was one huge tree! Note: The Tree is actually composed of three separate trunks which have long ago fused together (a common trait of these Mountain Hemlocks).... To read the signs better, please click here . But in 2003 the giant forest fires of the Bear and Booth Fires raged over this area and set a crown fire in this ancient tree, killing it, although leaving its bottom half unscathed. On September 4-5, the Bear and Booth fires merged and raged up Brush Creek and over Rockpile Mountain.... Fire news reports suggested that the historic tree and its historic trail junction had been lost forever, incinerated by the Fire; however, the truth was that very few people had even been aware of the existence of this historic trail junction, since both the trails at the junction had been abandoned and/or rerouted many years before the B&B struck. There was certainly never any fanfare at the high-altitude junction where the BCT joined the Summit Trail No. 65. Trail History lesson: on 1931 maps of the original "Oregon Skyline Trail," the Summit Trail No. 65 (ST) can be seen running several miles east of the indicated route of the Oregon Skyline Trail. At this time, the Summit Trail carried the name "Little Lake Trail. 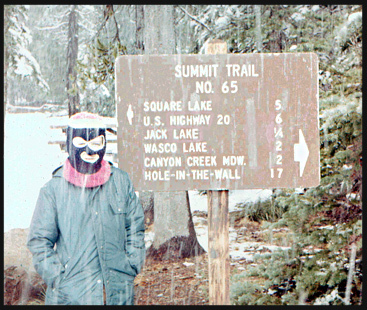 "...The Summit Trail image shown was taken in 1973 at Jack Lake, in the parking lot. Our picture occurred during a late June snow shower, that's why the image looks streaky. 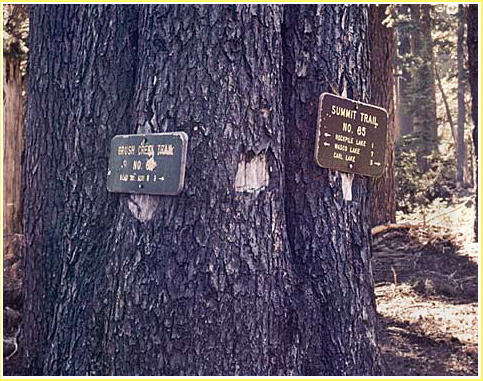 The image to left dates from 1973....The trail signs on the big Hemlock read as follow: "Summit Trail, NO. 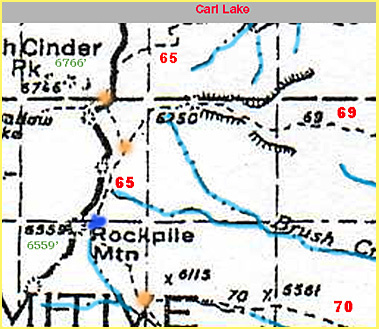 65, Rockpile Lake 1 mile, Wasco Lake (looks like) 7 miles, and Carl Lake (looks like) 3 miles." The destination on the Brush CreeK No. 69 sign is indechipherable, but modern map measurements show it to be approximately 3 1/2 miles to the former trailhead, which was at about 4,900 ft, somewhat above Abbot Butte Spring. Note: I possess some informative scans that I've made from 1965 maps of this region. Please email if interested. Below is a sample. The tan "spots" designate various junctions of the trail system then in place (circa 1965). The middle tan spot is where the above picture was taken! (Note: During its long history, the BCT had often been in uncertain status, often low on trail maintainance agendas for years at a time. On more modern maps the BCT had been renumbered by the Forest Service to Tr. 4004, click to see modern BCT sign picture). Reader Rodger Latham sent me the following GPS coordinates for the Big Fir (see page top). He reported, "it's near the junction of Cabot Creek and Candle Creek, not Jefferson Creek. At least this is what I find according to my maps. It is about 400 from the trailhead of the Jefferson Lake trail #4001. I also got a GPS position for it if that is of any interest to you, its elevation 3,150 feet, and N44°3500.6 and W121°4040.7 using WGS 84 datum." ** .Note: It is normal in any large forest fire for there to be areas that the fire skips over or hits less intensely, leaving less than 100% canopy kill..The final BAER Fire Intensity maps released 09-13-2003 showed that this historic trail junction had had the misfortune to be in the middle of a moderate intensity burn area. Final note re the Big Fir tree at page top: The May 1981 issue of Oregon Magazine printed a full page spread of an image taken by me on a nearby hikers footbridge; shown on that image were the same two dogs and the same hiker as in my image of the big Fir at top of this page. Late 2007 Trails Conditions Report- note also the new trail numbering system for the old trails---- "The Forest Service has issued the following warning concerning the Mt. Jefferson area: Due to past wildfire impacts in this area, portions of the Jefferson Lake Trail 4001, Sugarpine Ridge Trail 4002, Rockpile Lk Trail 4005, Minto Lk Trail 4006, and Brush Ck Trail 4004 have heavy blow down, dense brush and/or severe erosion. Some sections of trail are difficult to locate. The use of stock animals on these trails is not recommended this season. Hikers will consider sections of trail very difficult. Trails open and cleared in this area, with access to the Pacific Crest Trail include: Canyon Ck Trail 4010, Trail 4014 between Jack Lk and Wasco Lk/tie to the PCT, Cabot Lk Trail 4003 north to Table Lake and Shirley Lk Trail 4003.1 to the PCT. For more information please contact: Sisters Ranger District (541) 549 - 7700." READER UPDATE REPORT, SUMMER 2007, THIS RAISED SOME INTERESTING QUESTIONS--- Karen J. hiked past Rockpile Lake on the Pacific Crest Trail, and about half a mile north of the lake she found a sign for the Brush Creek trail atop a pile of rocks. That sign pointed downhill to the east. NOTE: THIS IS NOT THE LOCATION SHOWN IN THE PHOTOS OF THE HEMLOCK TREE WITH THE TWO TRAIL SIGNS..... WHAT SHE DESCRIBES LIES ABOUT ONE MILE TO THE SOUTHWEST, AND ABOUT 100 FEET HIGHER IN ELEVATION-- it's the junction of the modern PCT with what is probably a more modern routing of the historic Brush Creek Trail....Karen reports, "...from the top of the (Cascade) crest, it looks like you could follow the trail down to the east... There were no signs titled Summit Trail anywhere. At the turnoff to Brush Creek it is very desolate and burned with only smaller skeletons of trees in the vicinity. The sign that read Brush Creek was very old and weathered and did not have any brown paint on it. It wasnt obvious if it ever had been a painted sign.." The sign was more or less knocked off its old, weathered post; the post was not fully erect and pointed downhill to the northeast... She also added, "...Rockpile lake is like an oasis. It is surrounded by green forest, but only about a 1 mile circumference on either end of the lake. "....Click here to see the 1931 official Skyline Trail map, which labelS the Summit Trail as the "Little Lake Trail." (the Skyline Trail itself in 1931 ran almost wholly on the western side of the Cascade crest, visiting such destinations as Mowich Lake and Santiam Lake)..
Late 2008 Trail Conditions Report on the Brush Creek Trail in particular. I abbreviate using "BCT" to designate this trail. In September 2008, it was five years after the rampage of the B&B Complex Fire of 2003. I closely examined post-fire satellite imagery and compared with USGS topo maps. My conclusion was that it is "likely" that the historic trail junction and signage ESCAPED the burn! The fire had decimated the western side of the nearby Cascade Crest, but right around the presumed location of the signs, there had been only a few scattered spot-fire burns. The location of the junction that my TOPO software gave me is: elevation 6147 feet, 44deg, 33.713min N, and 121 deg, 47.893 min W.
IN MID-SEPTEMBER 2008, I received this Brush Creek trail (BCT) report from reader Steve C. .. Steve C. reported to me that he found the top portion of the trail by hiking cross-country from the two tiny ponds that are "north and east of Rockpile Lake." He says the trail is hardest to find in its bottom portions near Abbot Butte. Contact me! (click). 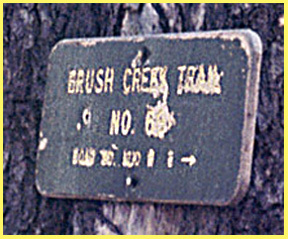 --- use: brucej@oregonphotos.com --- If you are planning to try to find the historic Brush Creek trail junction and its old signage, I will be happy to assist by sending you a jpeg map of the area -- it is a custom topographic map with waypoints, in exchange for your trail report! SEPTEMBER 2010. This report came in from Heidi regarding some of the old feeder trails to the north of the Brush Creek Trail---"Ran into your site while in a hunt for the origin of the name "Hole in the Wall Park" in the Mt. Jefferson wilderness. Yesterday hiked from the Cabot lake trailhead into the Hole in the Wall valley and back, a long 24 miles. We ran into the B and B burn again at the viewpoint sign for the Hole in the Wall Valley, Bear Butte, and beyond. The switchback trail into the valley is covered with burned debris. Have you any idea how Hole in the Wall Park got its name? We saw one wall that might have had a hole in it but it was way up on west hill of the Park." 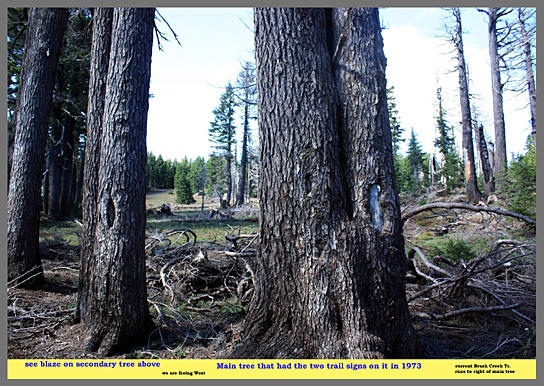 "You are probably aware of this, but the Sugarpine Ridge and Jefferson Lake trails are overgrown and not maintained. It's too bad the Forest Service didn't put signs right at the trailhead, warning hikers of this problem. There is a sign at the Sugarpine Ridge trail junction 0.7 miles from the trailhead but it does not indicate that the Jefferson Lake trail is overgrown by Ceanothus and not maintained. What is ridiculous is that there are "trail not maintained" signs in the wilderness at trail junctions at Patsy and Junction lakes and none at the actual trailhead." Below is one of the many pictures that a retired Park Ranger from Sisters provided to me in September 2010. He and I collaborated in the successful search. It was his impeccable on-the-ground skills that led to re-finding the lost trail junction and THE TREE. Although its wooden trail signs are long gone, the five deep blazes and other features match precisely. Although we had hoped (based on satellite photography of the burn damage) that THE TREE had survived the fires, my Ranger friend J. Thomas Jeffrey found that there had been many spot fires in the vicinity, one of which had gotten the crown (top) of THE TREE involved in a "crown fire," which had killed it, ending its centuries-long life. I felt sad to learn this. But the exploration of the area necessary to locate the tree led to many other finds of historic importance, allowing us to better trace and locate the historic trails that earlier generations used before there was a PCT. Below the picture I will outline our findings and theories, and ask for further help from correspondents. Here is the GPS of THE TREE= 121 47 55.07, 44 33 40.42, elevation 6,119 ft. Those of you who use GOOGLE EARTH will find a picture of THE TREE which was posted by Mr. Jeffrey. The tree lies about 100 yards uphill from the modern BCT, and if you are looking closely you can actually see old trail tread leaving the modern BCT at an acute angle, headed toward the tree, and with sharp eyes you can then follow the old trail tread right to THE TREE. Those with access to map libraries, in person or via the Internet, can help by analyzing old maps of the area to better delineate the routes and time sequences of the area's trail systems over the years between 1921 and the present. 2014-2016 News! Pictures and text are being added over the next few weeks detailing Ranger Thomas' finding of the old route of the Summit Trail between Rockpile Lake and The Tree. His exploration occurred on October 3, 2014.... Also, please note that I have various scans of old maps of the area. Contact me.